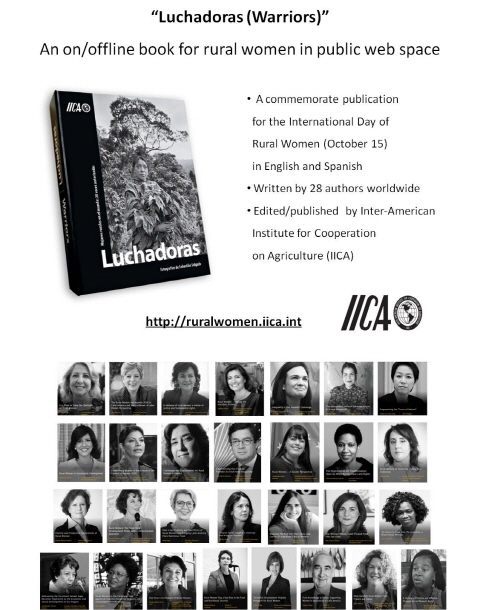 Inter-American Institute for Cooperation on Agriculture (IICA), based in San José, Costa Rica, published a book titled “Warriors - Rural Women Around the World: 28 Enlightened Voices,” to commemorate the International Day of Rural Women, established by the UN and celebrate the first hosting of the G20 and W20 meetings in South America. Women global leaders participated in the publication as co-authors: Chair of Women 20 Argentina, Vice President of the Government of Spain, Constitutional Vice President of the Dominican Republic, Former President of Repubic of Costra Rica, Vice President and Minister of Foreign Affairs of Republic of Panama, Executive Director of UN Women, Secretary of State for Citizenship and Equality of Government of Portugal, OECD Chief of Staff, Prime Minister of Barbados, Minister of Social Development of Argentine Republic, and Vice President and Minister of Foreign Affairs, Republic of Costa Rica and more. Also, some male global leaders including the President of the Inter-American Development Bank (IDB) who care rural women enmpowerment contributed for the publication as well. Ms. Angela Joo-Hyun Kang, Founder and Executive President of GCEF was invited as one of co-authors at the Roundtable Meeting of Rurual Inclusion of 2018 W20 on August 3, 2018 in Salta, Argentina, through her intervention during the meeting as W20 South Korean delegate. 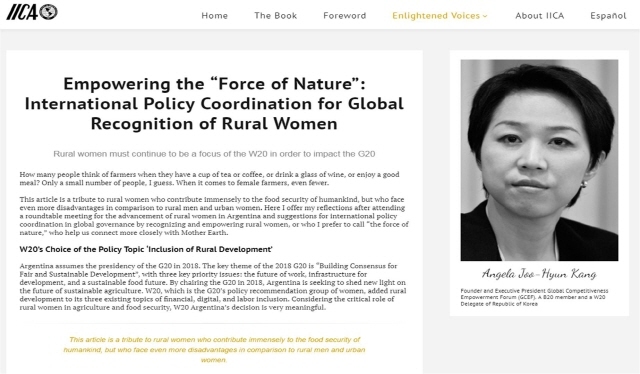 She contributed her article on South Korean policies for rural women empowerment and importance of inter & intra & global policy coordination among G20 and non-G20 countries. 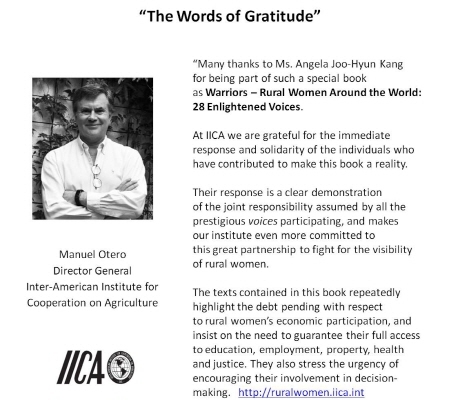 IICA sponsored the 2018 W20 Talk Concert, which GCEF has co-hosted and organized, in order to congratulate on the first offical promotion event of W20 in South Korea and raise awareness and important of rural women within South Korea.